During its first year on the market, the FAWSsit™ Fold-Away Wheelchair Shower has helped hundreds of people with disabilities enjoy the comfort and health benefits of a warm shower. At Care Giver Support Products (CGSP), the company that produces the FAWSsit Shower, staff members are excited about the interest generated by their very successful first product. As with most successful products, the self-contained FAWSsit Shower was designed with simplicity in mind. In about five minutes and without tools, the caregiver can set up the FAWSsit Shower anywhere there is warm water, a drain and electricity. The person in the wheelchair then rolls into the shower, takes a shower, and then rolls back out. 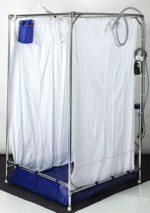 The FAWSsit Shower provides easy access for caregivers, weighs only 38 pounds and folds up for storage. For Judy Seidmeyer, President and CEO of CGSP, the past year has been rewarding not only for the business success but also for the happiness the FAWSsit Shower brings to her customers. She recalled one customer who had only sponge baths for 12 years. “I could see tears in her eyes when she received her FAWSsit Shower,” Judy said. Like a lot of other people, Darwin has found that the FAWSsit Shower not only saves time but also saves money. Because the FAWSsit Shower is so quick and easy to use, Darwin decided he didn't need to have his bathroom remodeled to accommodate an accessible shower. It also gave him more options when buying another home. With its success, CGSP has received its share of awards and recognition. The FAWSsit Shower received the Most Innovative New Product award at the MedTrade 2005 Convention in Atlanta where over a 1000 companies displayed their medical equipment. The FAWSsit Shower was also featured on The Learning Channel’s Inside Health with Peggy Fleming. CGSP is a member of National Association of Government Contractors (NAGC), a registrant in the Central Contractor Registry (CCR), and a member of the Society for Accessible Travel and Hospitality (SATH). However, success has not made the staff at CGSP complacent. In addition to their Standard shower model, designated the FAWSsit-S, the company is now offering three additional models. “The evolution of the product arose from necessity and demand,” said Pat Johnson, Marketing Vice President for CGSP. “The original FAWSsit met the needs of many disabled individuals, and yet there were some who were unable to benefit from the original design.” Pat explained that individuals requiring a reclining wheelchair or obese people requiring a bariatric wheelchair were unable to use the original design. To meet these needs, CGSP now offers the FAWSsit-R Reclining model and the FAWSsit-B Bariatric model. The FAWSsit-B is custom made to match the customer’s requirements. As the FAWSsit Shower’s popularity has grown, it has gained the attention of people without disabilities - and CGSP is meeting this need as well. 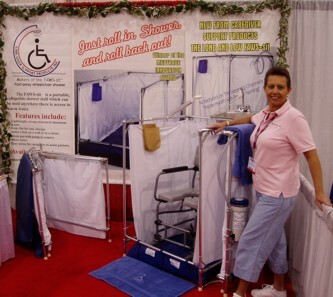 “Our newest design,” Pat said, “is the FAWSsit-T which is a stand-up shower developed for able-bodied individuals.” Pat added that people who request the FAWSsit-T Tall model are using it for camping, poolside and remodeling activities. “Some interest has also been shown by the military and civic groups for hazardous-material use,” Pat said. 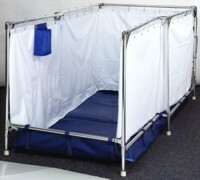 For further details of the FAWSsit Shower products, refer to the CGSP Web site at: www.fawssit.com.